Significant forces are involved in car accidents which cause more obvious and sometimes hidden injuries that don't show up until years later. Chiropractic care after an auto accident importantly guides the healing. This will help to avoid potential neck and lower back problems in the future. Whiplash is the more common term used to describe a Cervical Acceleration / Deceleration Injury, It happens whenever your body suffers from an abrupt jolt. When an automobile is hit from either direction, the impact forces the unprotected head and neck into a “whipping" motion, resulting in serious injury. 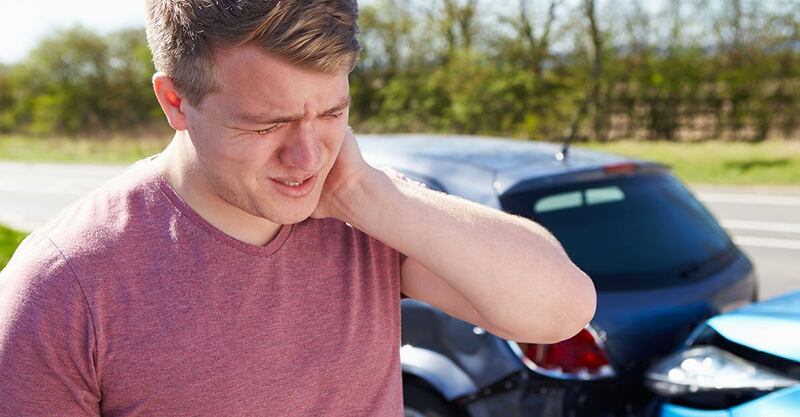 Unlike chronic injuries, whiplash is a very acute and painful condition that cannot be avoided. Most whiplash injuries happen when you are sitting in a fixed position in your car and are rear-ended by another car. Because this happens so fast, your body doesn’t have time to react before your car is pushed forward. During those moments of impact, your body gets pushed down into your seat. Your head, which is heavy and secluded by your neck, is delayed in reaction, while your body is continually pushed down. Quickly after, your head changes directions by traveling forward to the limit your seatbelt will allow. Finally, once your head reaches the limit traveling forward, it is forced backwards in reaction. Because your neck is not restricted by your seatbelt, your head is jolted back and forth beyond its standard limits. When this “whipping” action occurs, it causes much damage to the already extremely fragile neck structure. It can take two or three days before any whiplash symptoms occur. Common whiplash symptoms include headaches, neck pain, and loss of motion. The reason it can take a few days to feel the symptoms is because it can take time for the inflammation from the tiny tears in the injured ligaments and muscles to build up and further aggravate you. When the delicate ligaments that support your neck are wounded, the muscles react by tightening to guard the injured area. This protects the damaged area from further injury. Statistics say that every person will be in at least one automobile accident in their lifetime. Regardless of the extent of the accident, whiplash can have a lingering effect on one’s cervical spine (neck). Even if pain is not an immediate symptom, the damage done to the spinal cord and nervous system can go undetected until a chronic condition results. Treating the injury with therapy and different exercises, your body will have a much better chance of rebuilding properly. This means less chronic pain, stiffness, disc degeneration, and pinched nerves. We can help alleviate your pain and rebuild your spinal structures. These treatment options also severely reduce future injuries from occurring. So if you have whiplash, schedule an examination today with Dr. Golchehreh and Dr. Dokhanchifar. Our staff understands the complexities of personal injury cases, and we take great pride in managing these cases very thoroughly. Our office has well-established relationships with Orthopedists, Neurologists, MRI facilities, and Pain management, for the best and most complete care of acute trauma injury. Dr. Golchehreh and Dr. Dokhanchifar continue to update their knowledge with postgraduate courses. This allows us to confidently analyze, diagnose, and treat the various complexities of whiplash and soft tissue injuries. Additionally, we provide state of the art digital X-ray imaging on site. WE WILL COMMUNICATE WITH YOUR ATTORNEY ON A REGULAR BASIS. Your attorney will be informed of your treatment plan and updated with your progress and the cost of your treatment. Our office may recommend its patient to retain legal counsel in cases of personal injury to help assist in their case with the insurance company. We can also provide legal counsel recommendations if needed. A: It is important to get examined by the doctor first. The findings from your examination need to be documented immediately after your accident to determine the appropriate health care necessary for optimum recovery. After your Doctor's examination it would then be appropriate to consult an attorney for legal counsel. Q: What if I Need Orthopedics, Neurologists, and MRI Imaging Facilities? A: We will immediately refer you for a MRI or any imaging studies necessary to evaluate the extent of your injuries. We also work exclusively with other local qualified medical doctor specialists such as orthopedics & neurologists to provide any additional necessary care. Q: If I Need Chiropractic Care, Do I Have To Pay For It Myself? A: In most cases, your auto accident insurance will pay 100% for the cost of your chiropractic care. Our Office can assist you in obtaining this information. Using your medical coverage should not raise your premiums. If you settle before your injury is fully resolved, you will risk having to pay out of pocket for your care. A: You need a doctor who specializes in providing the necessary care and diagnosis of auto accident injuries. Usually hospitals will check vital signs, make sure there are no life-threatening conditions and release the patient with pain relief medication. They normally do not provide healthcare for the underlying injuries that can often lead to future pain. Thus after your hospital visit you need to make an immediate appointment like Dr. Golchehreh or Dr. Dokhanchifar. A: The care is absolutely safe, gentle and quite soothing. Our patients look forward to the care they receive during their office visits. A: Yes. The care is safe, gentle, and quite soothing. In fact, we have patients that range from newborn infants, children, and the elderly who receive effective relief. Getting care at Family Chiropractic Clinic is effective, long-lasting and life changing because doctors treat you as a unique individual, with no generic approach to your treatment protocol. Your care will be specific to you. They support your goals and integrate your care into a manageable and effective schedule. Sign up for our newsletter or refer a friend!